Something tells me that shouldn’t have been necessary in the first place… I’m not a toilet designer, but would you not ensure that the door could open before it is actually made?? My guess is that this wasn’t originally intended to be a bathroom. 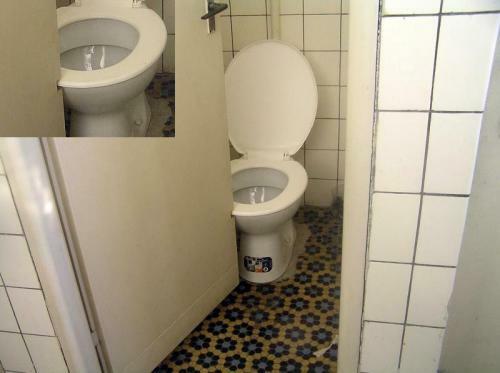 My guess would be that the original toilet seat was replaced, then the door was cut. Also, the toilet designer had nothing to do with it either way, it would have been the building engineer, or something, who was in charge of drawing up schematics (I don’t even know what schematics are) and making sure that the measurements were functional in real life. My guess would be that they did it on purpose. Simple answer, it’s the woman’s fault.